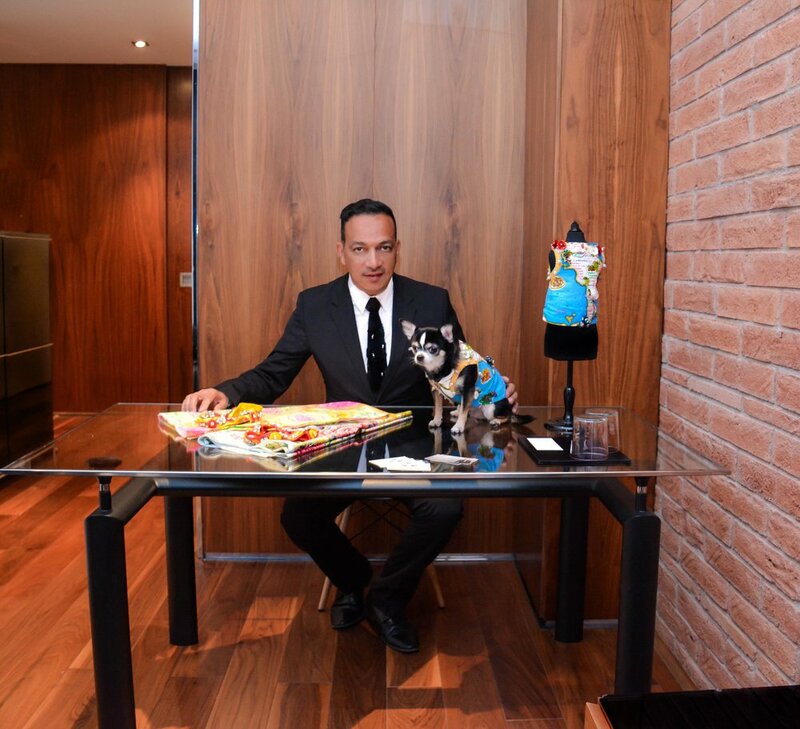 Anthony Rubio is an Internationally acclaimed Pet Couturier and Women’s Wear designer. Anthony along with his one-a-kind creations have been featured on Good Morning America, New York Times, The Today Show, TIME magazine, Vogue Italia, Harper’s Bazaar, Marie Claire, ELLE Mag UK, USA Today, MTV Style, Glamour Magazine, Yahoo! News, MSN News, Woman’s Wear Daily, New York Magazine’s The Cut, Refinery 29, People Magazine, Telemundo, Univision, Sports Illustrated among many others. I originally started as a Women's Wear designer with a formal education from F.I.T. Fast forward to many years later to when I rescued a badly beaten dog I would name Bandit Rubio in 2003. I soon realized that Bandit, a Chihuahua would tremble a lot when I would walk him. So I started to make stylish clothing, like no other, for him and soon after for other dogs. By late 2004, it was a full fledged business and I've been very fortunate to have my art covered by major media publications through out the world. As an Animal Advocate, I speak for those who have no voices. I've created catch phrase, “Adopt Me Maybe?” adopt a shelter pet campaign. I started this campaign in an effort to promote shelter pet adoption verses buying a pet in a store. I have also been part of other organization campaigns such as "The Shelter Pets Project" where I would dress dogs, in shelters, in my designs in an effort to get them adopted. With everything thing I've done, I have always included homeless animals in need via a collaboration with rescue groups and pet shelters. Since being invited to present my canine fashions as the first ever pet designer in the history of New York Fashion Week I have had to create Women's wear to coordinate with the Canine fashions. I like to remind everyone that the canines are the real models and the humans are the accessories. Every season, I partner up with animal shelters and animal organizations to include dogs that are up for adoption in these shows. It's not just having these dogs on the runway, it's also about getting exposure for the animal rescue organizations by telling the stories of the pets they have rescued. I've had dogs on my runway that were rescued from kill shelters, abandoned on the beaches in Puerto Rico, rescued from Yulin Dog Meat Festival in China, hoarder situations and more. If I were to show these dogs when they were first rescued, people would look away, but if I dressed them up in glamorous attire that would give the dog a personally, the people might stop and maybe adopt or help. I am very proud to say that this idea has brought great success with these rescues finding forever homes and families. Most recently, I have also included service dogs from The Guide Dog Foundation/ America's Vets and have personally sponsored guide dogs to be gifted to those in need. This coffee table book, which can only come to life with your backing will be 200 pages with dimensions 9.4 x 1.1 x 12.1 inches. I have hundreds if not thousands of images of my designs from the past 14 years that would easily fill a book. Those photos are already on my website or social media, but I want this book to be 90% filled with new images, Which is why I picked 5 extraordinary photographers, each with unique point of view. The book will be released in February, 2019. In the past, the photo shoots of my designs would feature a mixture of the dogs of my clients, dogs that are looking for their forever homes and your favorite social media pups. With the Canine Couture (working title) book I will include dogs from the various shelters I've work with. I will tell their stories and seek new shelters to partner with. Here is your chance to have your four-legged family member immortalized being photographed in one of my designs to have that photo appear in the book. We have photo shoots planned throughout the Summer of 2018 in New York City and a 4 day shoot set up in Los Angeles, CA in early August. I will pick the design for each dog that goes with my vision. I personally create each and every design. Depending on when you pledge, you may be able to pick the photographer of your preference to photograph your dog. I recommend that you consider a second choice because we anticipate fast bookings and selections will be made on a first come first serve basis. Dogs of all breeds and sizes are welcome.